First panel: Azzie willing separated himself form Grace?! He never does that, like ever. 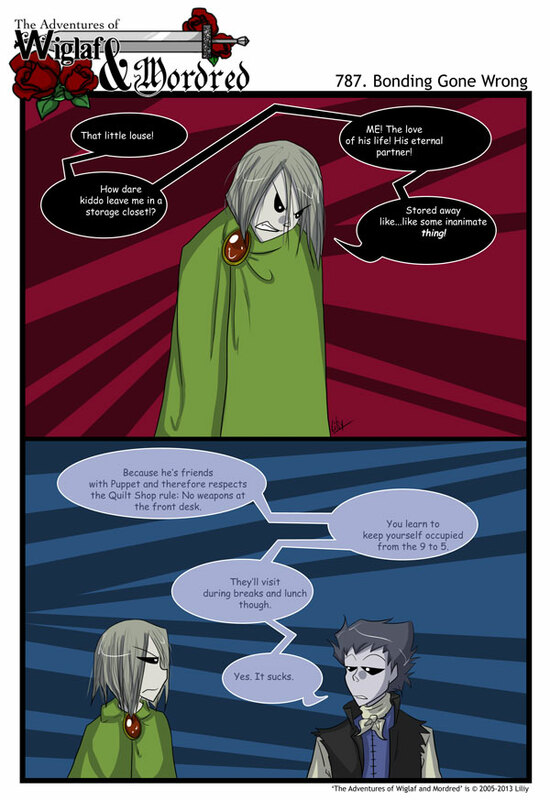 Second panel: XDD well that makes more sense. No wonder Grace looks so pissy. But still, holy crap, he willingly separated himself from Grace. That NEVER happens. Seems like Benjamin is the person with person with the most control over their artifact. I was wondering what the people in the quilt shop thought of the swords. Hmm. What else is stored in that closet? Seems somewhat dangerous if Eclat should come even remotely unbuckled. From what I’ve observed artifacts can affect each other. So could Éclat effectively “cure” all the artifacts and turn them human again? And what would happen if Éclat used his power on Gawain? He’s an animated corpse, which is in itself an inanimate objet.